With Kommuninvest, Swedish municipalities and county councils have their own tool for secure and cost-effective financing. 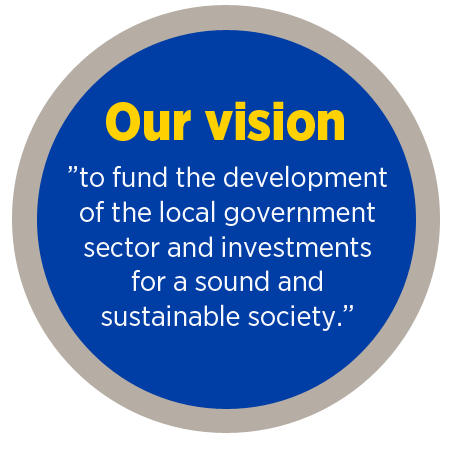 Our task is to fund the development of the local government sector and investments for a sound and sustainable society. The work is based on the owner directives adopted by the members of the Society. These state that Kommuninvest should contribute to sustainable development in society, both by reducing our own, direct environmental impact and the indirect environmental impact from lending and investments. In addition to efforts to reduce environmental impact, our sustainability work also includes efforts to support and develop our role as a responsible employer and corporate citizen. The international guidelines and principles that we follow include the UN programme for financial institutions (United Nations Environment Program Finance Initiative, UNEPFI), the Green Bond Principles and the Green Bond Harmonized Framework for Impact Reporting.